Well, it happened again, guys! The 222nd biannual meeting of the American Astronomical Society (AAS) held at the Indiana Convention Center, that’s what. For those of you not in the loop, the American Astronomical Society is a professional society for astronomers devoted to promoting astronomy and like sciences as well as enhancing education. We’ve covered previous meetings and will definitely be involved in future ones – you can learn more about AAS press conferences, read Sara’s wrap-up of the last meeting, follow Maggie’s adventures at the 2011 AAS meeting in Seattle, or even listen to our podcast from a meeting in 2010. The Spitzer Space Telescope was the topic of a lot of talk as newly-released images showed evidence of new star growth in areas far from the crowded center of our galaxy. This growth was found in “bubbles” that were found in a larger “bubble” in what is known as a bubble hierarchy (but not a drop to drink). These images, along with thousands of others, are searched through by the public through The Milky Way project, in hopes that new objects are found. Spitzer and other satellites are gathering infrared images of our galaxy as part of project known as the Galactic Legacy Infrared Mid-Plane Survey Extraordinaire (Glimpse 360). So far Glimpse 360 has mapped about 130 degrees of the night sky, and hopes to finish the other 230 degrees by the end of the year. 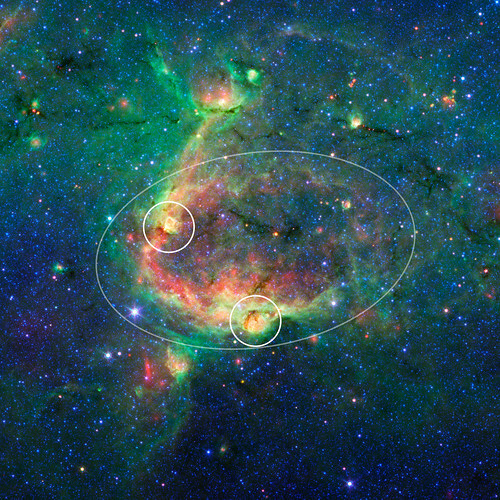 Spitzer’s infrared images were also used in conjunction with the Chandra X-ray observatory at NASA’s Marshall Space Flight Center, to find evidence of black holes amongst the first stars in the universe. “Our results indicate black holes are responsible for at least 20 percent of the cosmic infrared background, which indicates intense activity from black holes feeding on gas during the epoch of the first stars,” said Alexander Kashlinsky, an astrophysicist at NASA’s Goddard Space Flight Center. 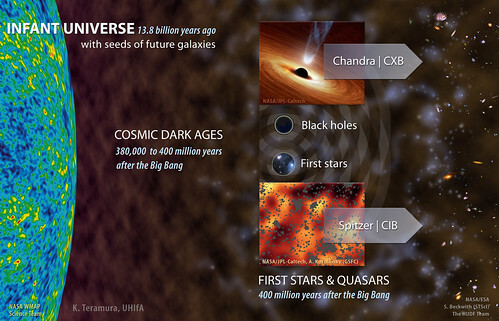 Comparing the infrared images to the X-ray images, 1 of every 5 sources suggest a black hole. This evidence means that over 20% of the cosmic infrared background (CIB) is created by black holes. 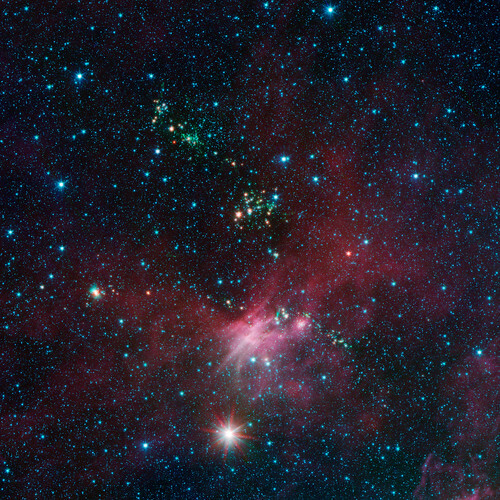 CIB is a background of infrared radiation seen by infrared cameras across the entire sky and is thought to be the collective light from when structures first emerged in the universe. Using data from both satellites, scientist can eliminate known sources and find telltale evidence that suggest CIB. However, some areas show sources of X-ray and infrared both and current evidence suggests that only black holes can emit this kind of energy. “This is an exciting and surprising result that may provide a first look into the era of initial galaxy formation in the universe,” said another contributor to the study, Harvey Moseley, a senior astrophysicist at Goddard. “It is essential that we continue this work and confirm it.” A paper was submitted on the findings in the May 20th, 2013 Astrophysical Journal and presented at the AAS meeting. 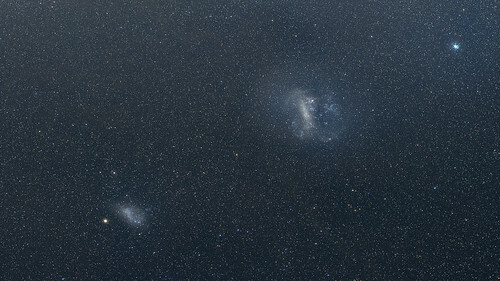 At the meeting, Goddard’s very own Stefan Immler presented astonishing new mosaics of the Large Magellanic Cloud (LMC) and the Small Magellanic Cloud (SMC), two of our galaxy’s nearest neighbors. These mosaics were created using the Swift observatory, which launched in 2005. 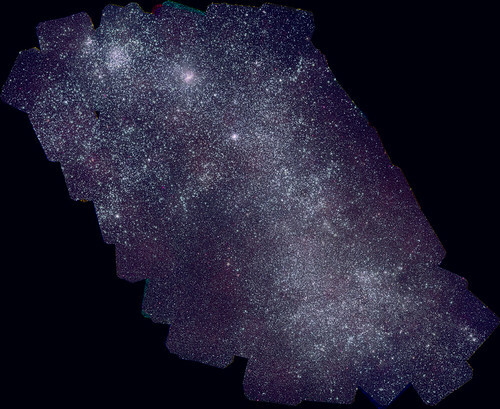 The mosaic of the LMC, which is over 163,000 light years away, boasts 160 megapixels and over 1 million UV sources, and the mosaic of the SMC (200,000 light years away) weighs in at 51 megapixels and around 250,000 UV sources. This is much bigger than the handful of megapixels your phone is packing! These two neighboring irregular galaxies are found outside the Milky Way orbiting each other as well as our own galaxy and can be faintly seen from the southern hemisphere. And there you have it! The universe at you fingertips, and something new to sate your appetite. The next AAS meeting is in January in Washington DC with plenty of new science to throw at you. As always, leave your comments and/or questions!